With the holidays quickly approaching, I’m planning meals for the family that are delicious but are nutritious as well. Everyone loves a great muffin, particularly one that is moist and nutty and oh so satisfying. 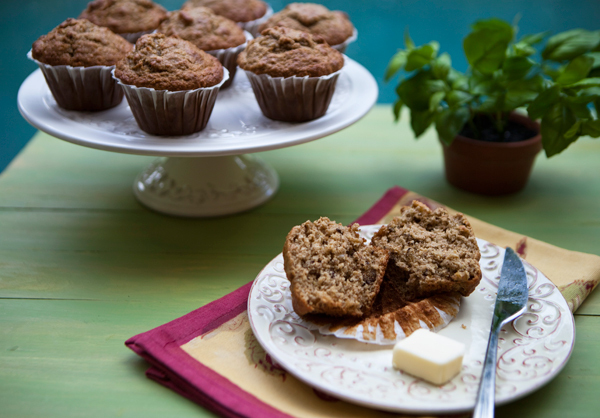 This quick recipe contains buttermilk and olive oil which along with the bananas really help to keep the muffins moist. I added walnuts to my muffins, but you could also add chocolate chips along with, or instead of the walnuts. Butter was replaced with olive oil, a heart healthy mono-unsaturated oil. 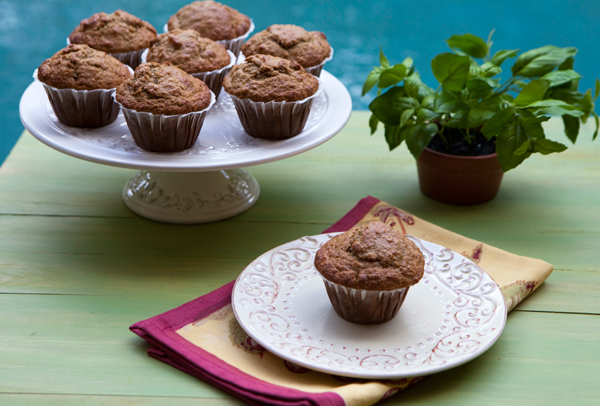 The addition of whole wheat flour and flax seeds help to make this muffin heart healthy. A moist muffin that is also packed full of healthy grains. Lightly grease a 12 cup muffin pan or line with muffin papers. Whisk together the eggs and brown sugar until smooth, then add the buttermilk, bananas, oats, olive oil, and vanilla and mix well. Stir together the flours, baking powder, baking soda, salt and cinnamon. Fold in the chopped walnuts, and pour into the muffin tin filling the cups 3/4 full. Bake until golden brown and set in the center, about 20 minutes. Cool 15 minutes and then remove from the pan.